The SCR performs (3) functions: switch, latch and reverse polarity diode (reverse blocking thyristor). 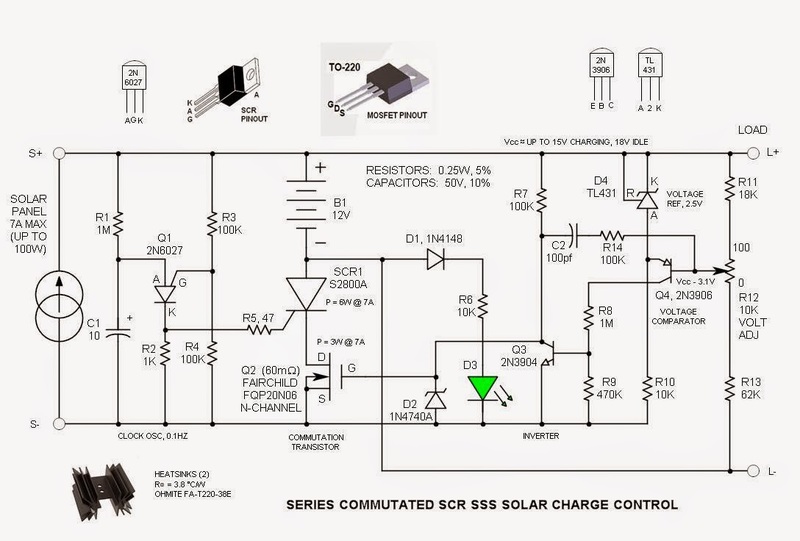 The SCR conducts the charging current from the solar panel to the battery while a series. A series commutated SCR makes a very unusual Solid State Switch in this solar charge regulator control. Advantages include simplicity and robustness.MOSFET performs the function of commutating (turning off) the SCR current at the end of the conduction period. All circuitry consists of readily available discrete components. The SCR has its gate driven by a PUT (Programmable Unijunction Transistor) gate driver. The advantage is high gate drive current (100mA peak), fast pulse rise-time and Schmitt Trigger type of operation. Q1 is wired as a free-running oscillator that outputs pulses every 6seconds (0.1HZ). Resistors R3 & R4 bias the gate of the PUT at mid voltage. When C1 charges to one junction drop above the gate voltage, it fires and the charge in C1 is dumped into the SCR gate. R5 limits the peak current and extends the pulse duration. When the PUT anode voltage drops below the threshold current, the PUT turns off and the cycle repeats. Operation is simple –Q1 keeps firing the SCR while the voltage regulator keeps commutating the SCR via turning off the normally conducting MOSFET (Q2). When the SCR is Off, LED D3 is illuminated. When the battery is low, the LED does not light –it lights only when the battery voltage setting has been reached. When the battery is fully charged, the SCR conducts for only a short period of time in each 6sec oscillator period. A TL431 is strapped to regulate at its minimum voltage of 2.5V. R10 biases it at about 1mA. It is referenced to the positive battery terminal. This is far superior to a low voltage zener because it has very low dynamic resistance and low thermal temperature coefficient (sharp threshold). Q4 is a PNP transistor that performs the function of voltage comparator. It compares the output of the feedback voltage divider from the battery with the 2.5V reference. As the battery voltage increases beyond this threshold, collector current begins to flow and subsequently turns on Q3. When the collector voltage of Q3 drops to zero, the MOSFET turns Off, subsequently commutating the SCR. Positive feedback is provided by capacitor C2 –it couples the change in Q3 collector voltage back to the base of Q4. While a bipolar transistor has a Vbe that is temperature dependent, it tends to track the battery voltage that is also temperature dependent. No attempt was made for accurate temperature compensation. The S2800A has a 50uS turn-off time specification. The minimum commutation period that I observed is about 1mS –overkill. 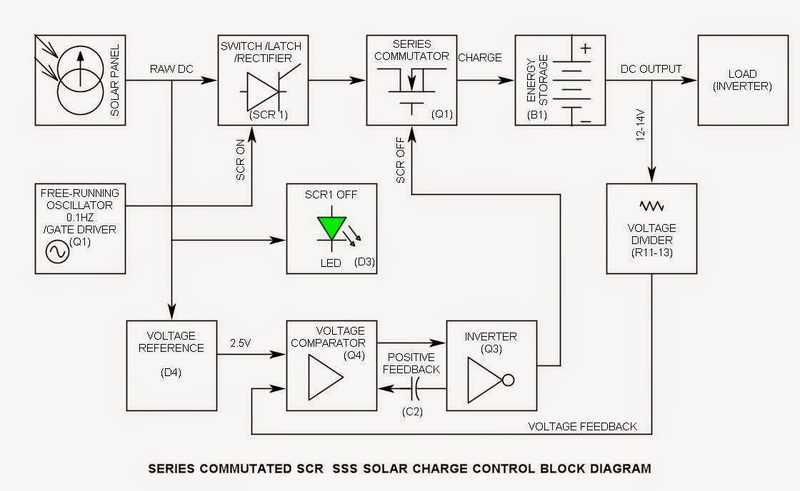 2 Responses to "Solar Charge Control By Using Series Commutated SCR SSS"